Those famous finger snaps, and like Pavlov’s pups so many of us are transported into The Addams Family mansion. Growing up I always thought maybe I’d been switched at birth with The Addams Family; I don’t believe I was the only person in my family who felt the same. 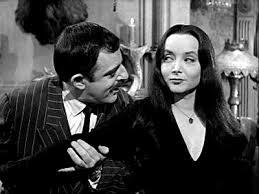 For me, John Astin brought the Charles Addams cartoons to life with his irresistible paranormal charm. Though wealthy, The Addams Family macabre eccentricity caused them to live as outcasts; it was a role they seemed to relish. They were also portrayed as close-knit, respectful, and loving. This satirical translation of an ideal American family may not have lasted long, but their influence refuses to give up the ghost, including: movies (the best with Raul Julia, Anjelica Houston, Christina Ricci, Carol Kane, Christopher Lloyd, Joan Cusack, etc. ), cartoons, books, games, musicals – they simply refuse to pass on. The Addams Family motto: Sic gorgiamus allos subjectatos nunc. In Addams Latin, simply: We gladly feast on those who would subdue us. 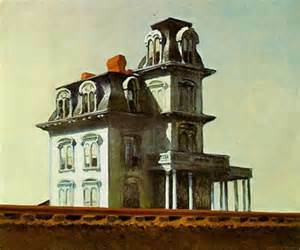 Their mansion at 0001 Cemetary Lane was inspired by Edward Hopper’s 1925 painting about the alienation of modern life, House by the Railroad. Looks like Charles Addams’ friend, Alfred Hitchcock may have liked the painting too, think Psycho. 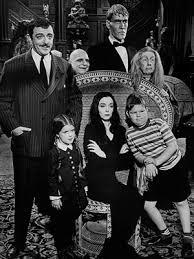 Charles Addams had no names for the family in his one-panel cartoons, for the TV series he helped pick some out. The nursery rhyme line, Wednesday’s child is full of woe was inspiring. Margaret Hamilton, the Wicked Witch of Wizard of Oz fame played Morticia’s Mom. The Addams Family loved pets, including but not limited to: a vulture, piranha, an octopus, a giant squid, a man-eating plant, a jaguar, spiders, and who could forget Kitty Kat? Ted Cassidy as Lurch gave himself a speaking role by ad-libbing, “You rang?” and also played Thing T. Thing (guess what the T stands for). And I’m listening to the CD of original music from The Addams Family, composed by incomparable Vic Mizzy right now, cara mia. Thanks. Now I have the theme song stuck in my head! I loved this show! 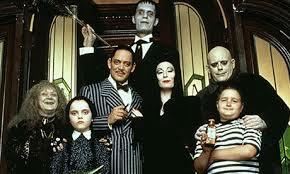 Nobody could do a scarey thing like the Addams Family! I read the article and just found out that “Margaret Hamilton, the Wicked Witch of Wizard of Oz fame played Morticia’s Mom.”— that’s a cool thing! Love to remember this-could not miss an episode as a child!! I always wanted to be, “Wednesday,” on any given day…. One of my favourite movies – the version with Raul Julia, Anjelica Houston. Briliiant casting, brilliant acting. Love, love, love it. Love the movies and their charming horror. They are perfect. Thank you for this timely post! They were. Thanks for dropping by. 🙂 Happy Halloween! Thanks for linking to this old post, Donna. I had not seen it. I used to love Halloween so much before I came here. This was a delight. Mega hugs.